Whenever dictatorships fall, their monuments fall, too. It’s part of the heady celebration of liberation — the need to literally pull down these hated symbols that have for too long cast shadows across city squares and loomed over a country’s citizens. But for history buffs, the destruction of these relics paying tribute to a dead political past is a true loss. More than 20 years after the Berlin Wall fell and the Soviet Union collapsed it is becoming increasingly difficult for travellers to find remnants of this recent history. In many cases what remains has been stripped of meaning. The vestiges of communism have lost their ability to evoke terror. Communism has become kitsch. For example, in post-reunification Germany only a tiny portion of the infamous Berlin Wall remains standing (where you can watch tourists zipping by on Segways), poorly made Trabants have become weirdly hip and the deadly Cold War crossing Checkpoint Charlie is like an American theme park (complete with fake passport stamps for a fee). The most visible and largely unchanged reminder of the aspirations of communist East Germany is the incredibly ugly, but still functional, Berliner Fernsehturm, which towers above the hustle and bustle on Alexanderplatz. A park in Hungary has taken a different approach. Forty-two pieces of Communist era public art tributes to workers, the party and its dear leaders were saved from the scrapyard in 1989-1990 and later put on display in Memento Park, located on the outskirts of Buda. 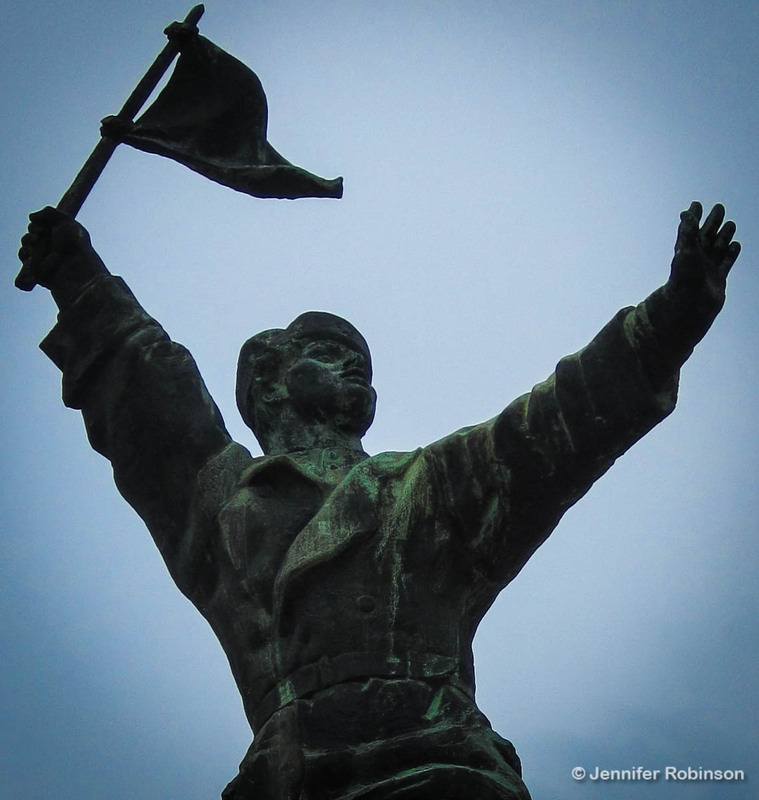 For 4,500 Hungarian forints (approximately $20 Cdn/US), visitors can take a direct bus from downtown Budapest to stroll among the busts and giant statues of Lenin and Marx, as well as idealized figures of workers and soldiers, that once littered the Hungarian capital. When I visited in May 2010, I was stunned by the artistic style of these figures after hours spent admiring classical Grecian marbles in the Louvre and Vatican Museum in Rome. 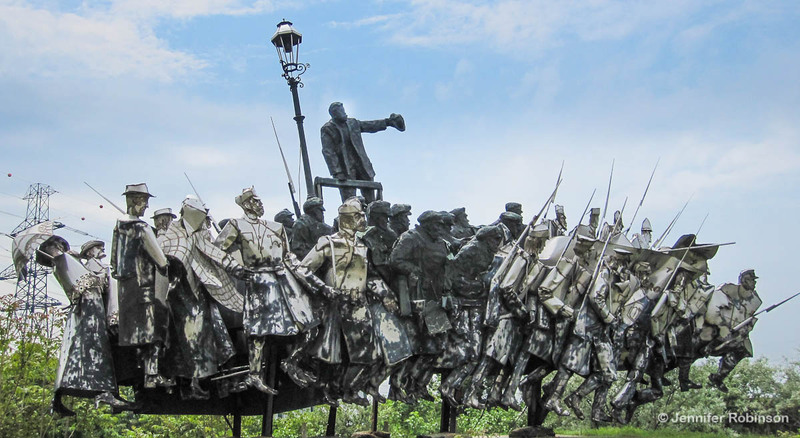 The Communist statues are shocking in their simplicity and directness in calling on all who view them to pick up the rifle and follow the hammer and sickle. 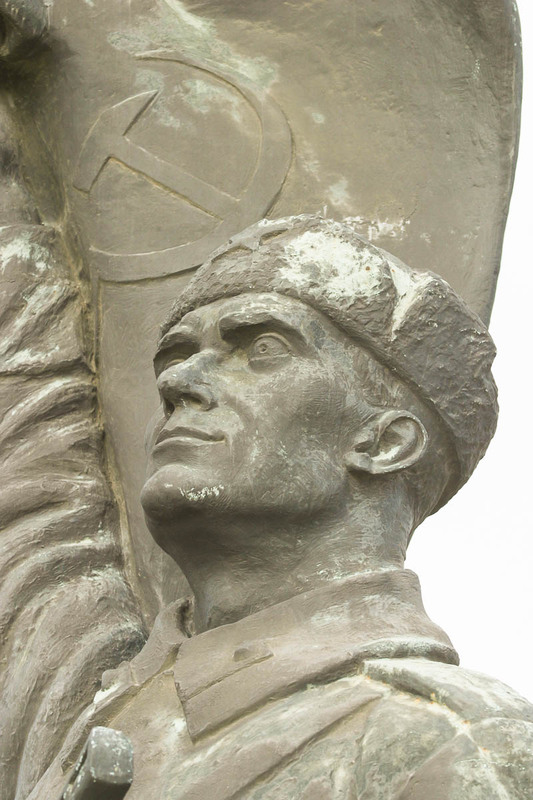 The eyes of one Soviet soldier are so scarily focused he’ll give you the willies. Like the Communist state, all extraneous symbols and individualism have been stripped away. Features are crudely hewn from the stone and the hammer and sickle is everywhere. They are colossal, brutish, overbearing . . . and fascinating. The park, which is primarily aimed at Western tourists, manages to successfully explore both the facade of communism and its brutality, particularly during Hungary’s crushed 1956 uprising when the toppling of the government led Soviet troops to invade, killing more than 2,500 Hungarians and forcing an estimated 200,000 to flee as refugees. Tens of thousands were also arrested and several hundred executed. The importance of destroying hated symbols of a regime can be seen in the park’s recreation of the Communist Grandstand, which once stood in central Budapest. 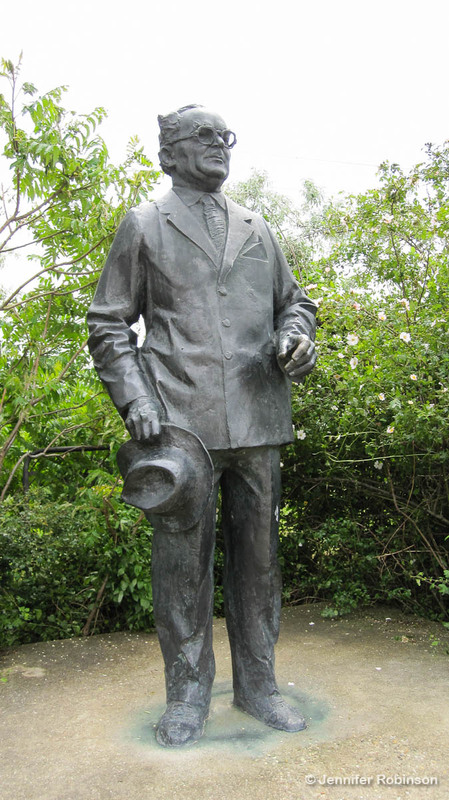 During the October 1956 revolution, angry demonstrators pulled down the grandstand’s eight-metre-tall bronze of the feared Soviet Leader Joseph Stalin, leaving behind only the dictator’s boots. Like Stalin’s boots, Memento Park lampoons communism (see the kitschy items in the tiny gift shop, particularly the CD collection of communism’s greatest hits) and terrifies with its authentic collection of black-and-white training films created by the Hungarian Ministry of Interior Affairs. These films, which have been edited into a montage for the park, were used to train secret police agents on the best ways to spy and report on their neighbours, hide listening devices and search homes, as well as intimidate and coerce others to spy for the regime. 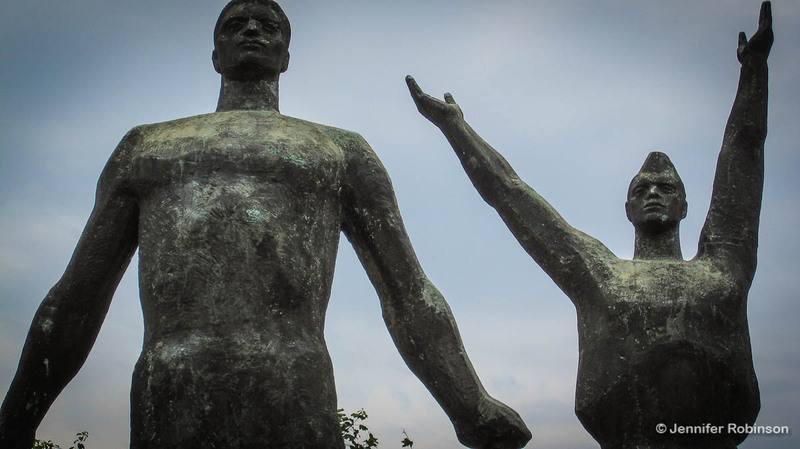 Memento Park, which opened in 1993, is not the only site in Budapest that tackles the ghosts of Hungary’s Communist past. Another excellent site to visit is the Terror Haza Museum on Andrássy Street in Budapest, which I will write a blog post on at a later date.